Hieronymus Bosch (c 1450–1516), The Garden of Earthly Delights (detail of right panel) (1480-1505), triptych, oil on panel, 220 x 390 cm, Prado Museum, Madrid. Wikimedia Commons. In case your calendar hasn’t already warned you: this summer we commemorate the five-hundredth anniversary of the death of Hieronymus Bosch (c 1450-1516). The official anniversary is 9 August, which will be exactly 500 years since his burial, but publishers and galleries are already hard at work building our enthusiasm. Here are my suggestions for exhibitions worth attending, and books worth buying (or borrowing). The big exhibition in Bosch’s home town of ‘s-Hertogenbosch, Jheronimus Bosch – Visions of a Genius, has already been and gone. It brought 20 paintings, 19 drawings, and more, to the Noordbrabants Museum, but closed on 8 May 2016. The town will continue to celebrate with a range of events from circus to music concerts well into next year, though. Its events calendar details those. Hieronymus Bosch (c 1450–1516), The Garden of Earthly Delights (1480-1505), triptych, oil on panel, 220 x 390 cm, Prado Museum, Madrid. Wikimedia Commons. The main exhibition to look forward to now is that at Museo del Prado in Madrid, Spain. This opens on 31 May and runs to 11 September 2016. Because it includes all the works held at the Prado, it is actually more comprehensive, with 25 paintings by Bosch and a total of 65 works in all. Full details are at the Prado website. The extended catalogue for the exhibition in Noordbrabants Museum has been published as Matthijs Ilsink & Jos Koldeweij, Hieronymous Bosch. Visions of Genius, Yale UP (Mercatorfonds); ISBN 978 0 300 22013 1. The large format paperback version is very reasonably priced at around £20. Its text is structured on his biography, and the exhibition catalogue, which limits its coverage of those major works, such as The Garden of Earthly Delights, which did not make it out of the Prado to the first exhibition. This makes it something less than a complete account of Bosch’s work, which is a shame. It includes excellent illustrations, with a fair balance between those showing whole paintings, and those of their details. If you want an affordable and comprehensive account, Taschen has re-issued Stefan Fischer‘s Hieronymous Bosch, the Complete Works, in its Bibliotheca Universalis series; ISBN 978 3 8365 3850 3. This is a 2016 reprint of the 2013 original, a small format hardback which is 517 pages fat, and a bargain at around £12. 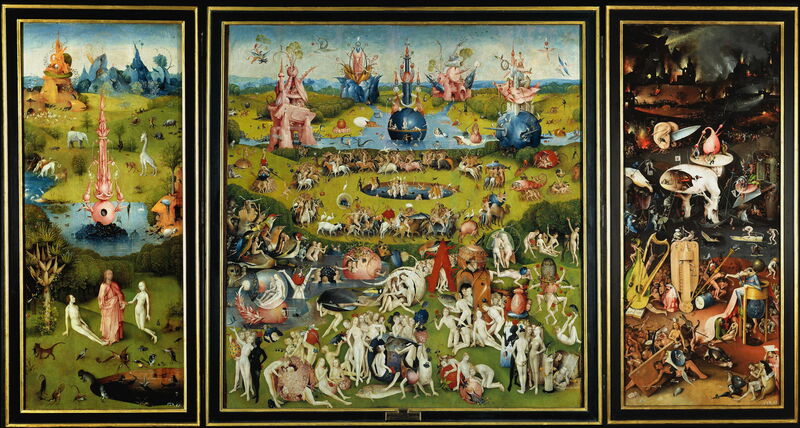 This gives a complete account of Bosch’s work within a biographic structure, devoting separate chapters to his major works The Temptation of St Anthony, the Garden of Earthly Delights, and The Last Judgement. It also includes catalogues of his paintings and drawings. It overcomes the limitations of its small format by showing lots of details of the paintings. Its text is excellent and analytical, with a supplement of additional text sources, and a huge bibliography. This book is an excellent all-rounder at a bargain price; there is also a larger format, 300 page version available for around £19. At the other extreme is Till-Holger Borchert‘s Bosch in Detail, Ludion; ISBN 978 9 491 81951 3. This is a huge format book to fill most coffee tables, and is very modestly-priced at around £29.95 in hardback. Its illustrations are superb, and are up to the quality of this ‘in detail’ series, showing details which no other book can come near. It is also reasonably self-contained, starting with a survey of Bosch’s works. The bulk of the book then works through themed details, from landscapes to the four elements. This is perhaps best seen as an excellent supplementary which will put your nose right on the paint layer of each of Bosch’s amazing works. I have now reviewed the new catalogue raisonné, by Matthijs Ilsink & Jos Koldeweij: Hieronymus Bosch, Painter and Draughtsman: Catalogue Raisonné, costing around £90. Although a very heavy and bulky book, it is undoubtedly the best of them all, and excellent value. The same research project has produced a companion volume, edited by Luuk Hoogstede & Ron Spronk, Hieronymus Bosch, Painter and Draughtsman: Technical Studies, Yale UP (Mercatorfonds); ISBN 978 0 300 22015 5. This is a large format hardback at the cost of around £76.50. It gives a systematic account of the technical details of the 21 paintings accepted by the new catalogue raisonné as being by Bosch, 4 attributed to his workshop, 7 to followers, 2 to either workshop or followers, and 3 supplementary works. It is rich with superb technical analyses, including details such as the dendrochronology, and contains thorough if not exhaustive images, including many from infra-red and X-ray studies. My only disappointment with this book is that it does not attempt any systematic or synthetic account across the works, for instance trying to build a coherent picture of Bosch’s techniques. However it is essential for the more serious scholar, and a unique compendium of this information. Hieronymus Bosch (c 1450–1516), The Hay Wagon (c 1515), triptych, oil on panel, 147.1 x 212 cm, Prado Museum, Madrid. Wikimedia Commons. 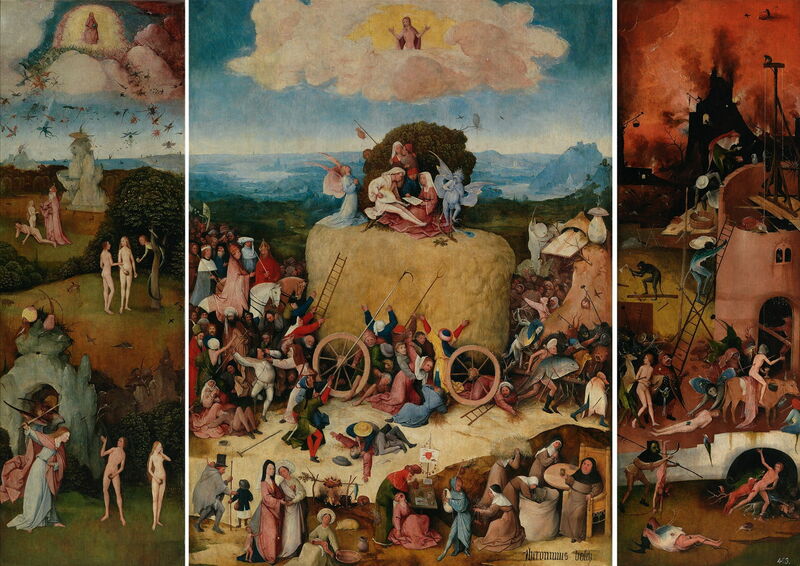 There are a few iOS apps containing collections of Bosch’s paintings, most costing around £0.79 each. I cannot vouch for any of them. Very disappointingly there is an almost total lack of other modern media: I can find no DVDs, movies, or other worthwhile content in iTunes. Perhaps one of the exhibitions will be offered in movie form later in the year. I am holding off further coverage of Bosch and his works until next month, but you can expect to see several articles from then through into the early autumn. He has always been one of my favourite artists, and I have been fascinated by his paintings since I was a child. Posted in General, Life, Painting and tagged books, Bosch, painting. Bookmark the permalink. I have updated this to link to my review of the catalogue raisonné, now that I have my copy.